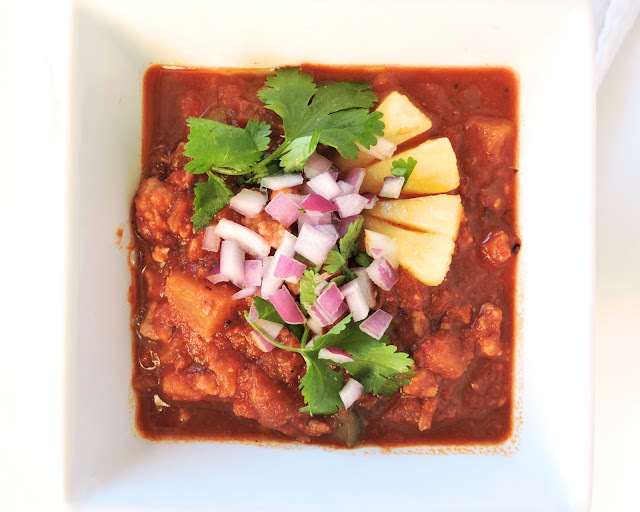 Winter weather, an ever-hungry boyfriend, and the Super Bowl: three reasons I felt the timing was just right for another chili recipe! This one is just as easy & just as Paleo as my good ol' "All American Crockpot Chili", but brings a little "I'm ready for summer time" flair with sweet pineapple cooked in to that savory base. In fact, this one is Whole30 compliant as written in the recipe- no need for changes! I've been loving ground pork for something different, as it has a milder, sweeter flavor than our usual grass-fed ground beef. Pork is also super inexpensive, which I certainly don't mind! 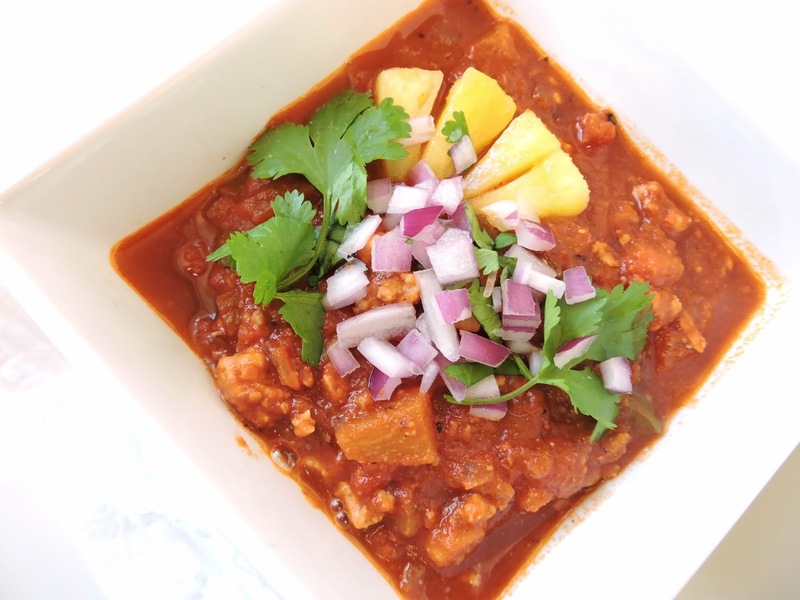 Paired with a rich tomato sauce, juicy pineapple, & the right spices mixed in, this sweet-savory dish has that perfect BBQ flavor without any sweeteners. Give this one a try, and let your crock pot do the work. Perfect with plantain chips for dipping or scooped over a baked potato, this is one to please a crowd! Heat the avocado oil over medium-high in a large skillet. Add the ground pork, and cook until no longer pink. Toss the pork and all remaining ingredients into a slow cooker, and give it a good stir to combine. 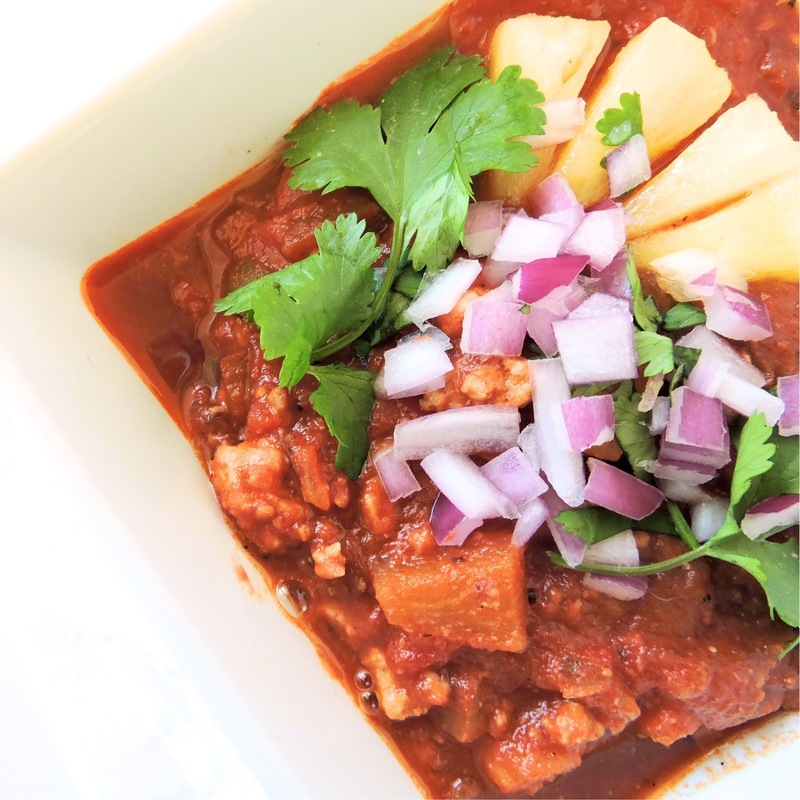 Top with extra pineapple, chopped onion, and cilantro (if you like) and serve hot! I substituted a 14 oz bag of frozen "Fire Roasted Bell Peppers & Onions" from Trader Joe's to save time and add some extra flavor. You can use fresh pineapple, or frozen chopped pineapple. Crushed pineapple would taste yummy too!